The Moxi Ivy Jungle Skates are brown leopard print vinyl skates, vegan friendly, complete with outdoor wheels and ready to roll! The MOXI Ivy Jungle Roller Skate! 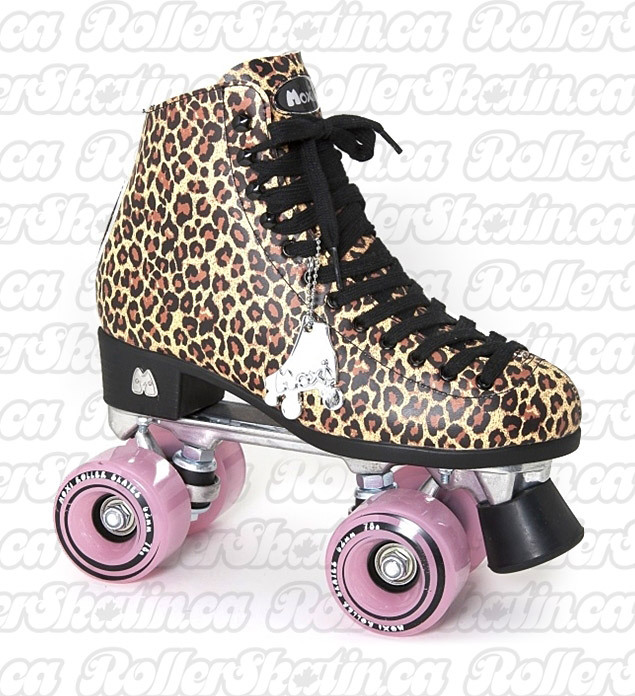 The Moxi Ivy Jungle Skates are brown leopard print vinyl skates, vegan friendly, complete and ready to roll! They come with Moxi Juicy Pink Frost Outdoor Wheels which can be used for indoor or outdoor skating. The Moxi Ivy Jungle Skates have been super popular because of its classic animal print look and neutral colors that make them a perfect accent for any outfit! Add one or two optional back brakes if you skate on trails with hills involved and want to stop quickly in a front facing position. Don't forget to order safety equipment too! • • NOTE: Current Sizes Available as shown in the Pull-down menu - More sizes may become available soon - Check back or Email your request! • • Use caution when skating outdoors – and Always use Safety equipment and follow your local municipal bylaws!